One of the major destinations, the city of Gandhi Nagar of Gujarat has a number of locations for the tourists to divulge. Some of the places because of which the city has got the accolade of the must visit places of western India are Akshardham temple, Capital Complex, Children’s Park, and Sarita Udyan. 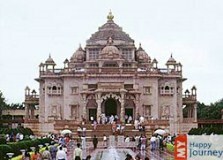 People from all over the world reach Gandhi Nagar to see the biggest temple of India, which is the Akshardham temple. This temple is built by the same organization, which built its counterpart in New Delhi, which is also known by the same name. This temple is actually a cultural centre for tourists. The large spread area of the temple encompasses one huge monument and several gardens. These gardens are mainly used as picnic spots by the locals and the tourists. If you are travelling with your family, then one not to miss place is the Children’s Park. Apart from various swings, the park provides the facility of boating and riding in a mini train. If you are looking for amazing spots to spend some quality time with your family, then deer park and the Sarita Udyan are some very good options.